The second day starts in the wildlife wetlands near Newport and takes me to the Severn Bridge (a short diversion form the path! ), icon of 1960s modernism. I stayed overnight at the Cedar House at Nash. The landlady told me some of the stories that Rosie had told her when she passed that way on her own journey round the Coast Path. She wants to be the first Brazilian to do the route and sounds quite a character … I’m looking forward to meeting when our paths cross somewhere in North Wales, and maybe hearing some of the stories from her own mouth. The landlady at the Cedar House gave me one of their business cards. She told me that she was thinking of laminating a few and pinning them along nearby points of the coast path – an interesting (non-digital!) take on off-path destinations for Claire. Claire described her life as living in a bubble. I can’t recall exactly what was on the news to prompt this discussion, maybe the aftermath of the Boston Marathon bombing. In an age of instant global media, the flood of traumatic events that we can do nothing about can seem overwhelming; Claire described a sense of disassociation, ignoring much of the media tumult and focusing on the small world about her. It reminds me a little of the Hobbits in the Shire in Tolkien‘s writing, although whether that made me Gandalf or Bilbo Baggins I’m not sure. 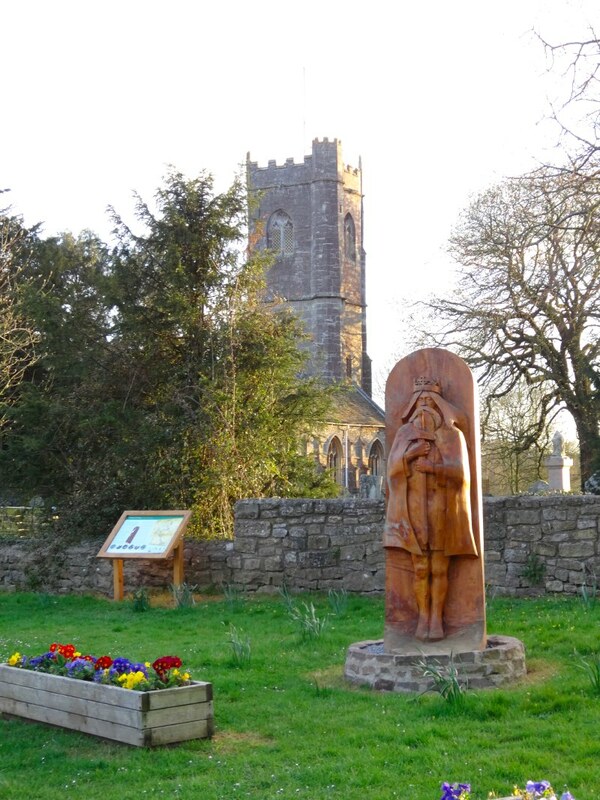 It was a short walk from Cedar House into Nash where I had finished last night and I passed again the church with the flood plaque and the Waterloo Inn before setting off on the fresh path, across fields, back towards the sea. 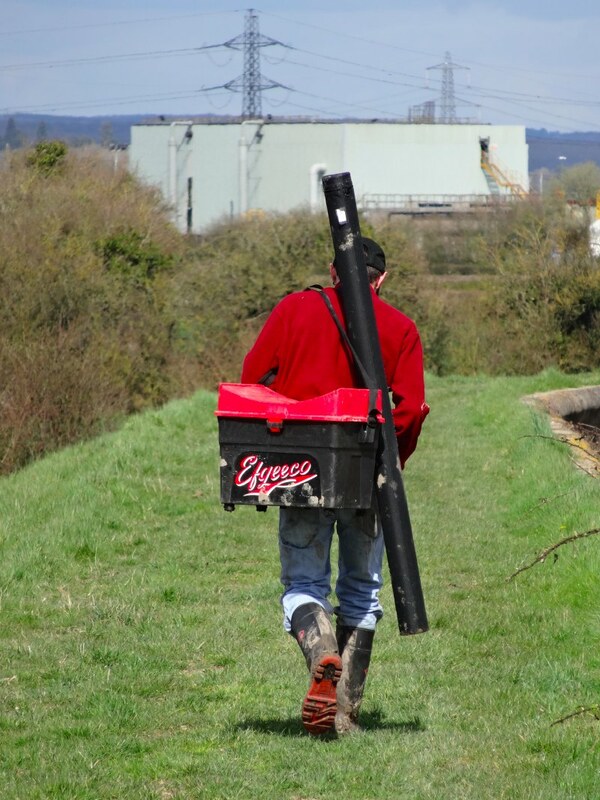 Nash is a few miles inland, but a power station stops the path tracking the Usk river completely along the waterside to the sea. I didn’t start as promptly as I intended and I had a long day ahead, around 24 miles, albeit very flat. So I set as good a pace as I could, and maybe because of that I had my first detour from the path (aka ‘lost’), although not by any means my last. 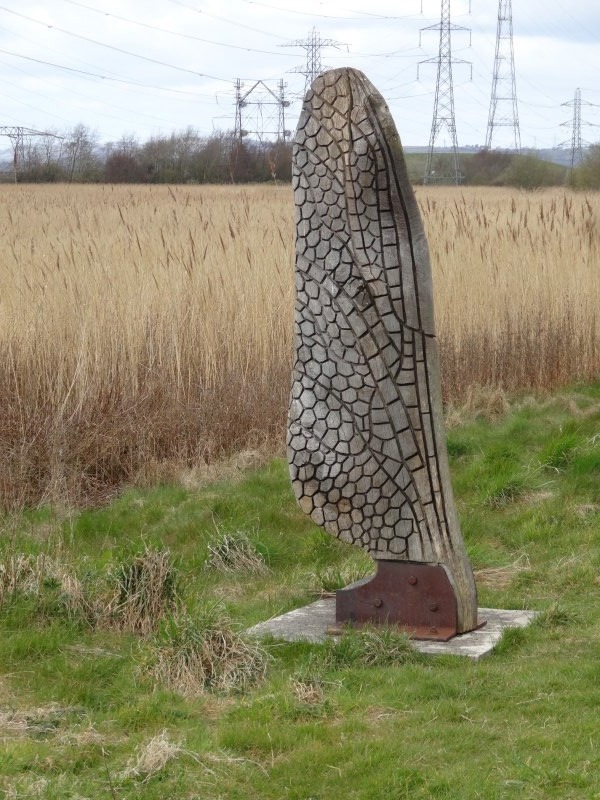 I knew the way led near the Newport Wetlands and when the path joined a small lane near the visitor centre, I turned to go past it (and towards the sea), whereas I think I should have turned the other way and taken a slightly longer arc skirting the edge of the wetlands. The Newport Wetlands were created as a reserve as a form of environmental compensation when Cardiff Bay was enclosed and in the process losing some wildlife habitats beside the Taff and Ely. 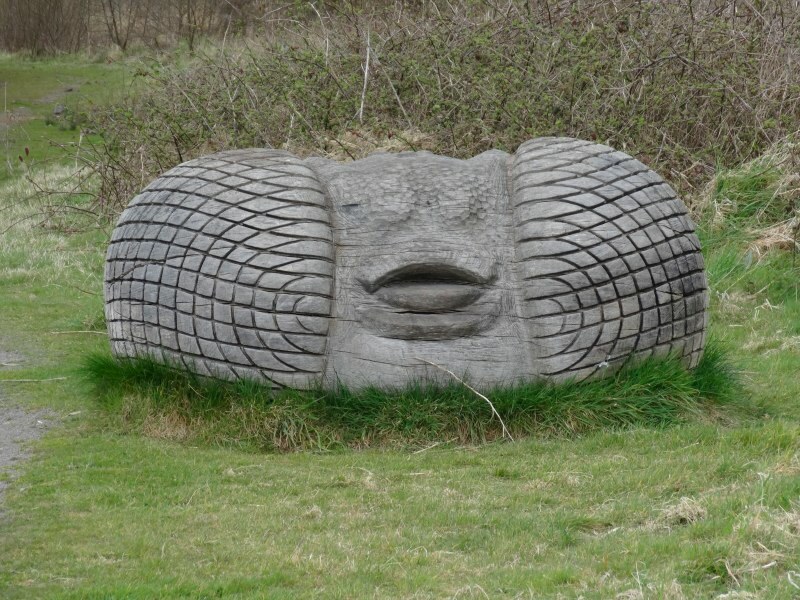 Along the coast there are many wildlife reserves, which at first seem perfect for the Coast Path, allowing walkers to go through managed natural areas. 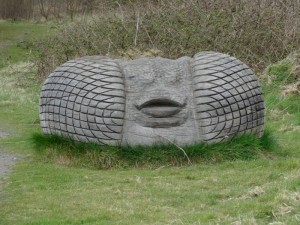 However, the opposite is the case as it is feared that the volume of visitors attracted by the Coast Path will disrupt the wildlife, so often, as here, the Coast Path skirts reserves. However, I ended up going through the middle of the reserve, itself clearly designed to attract visitors with an extensive visitor centre including a café and artworks along its well-laid paths. Of course these are paths designed for meandering along, rather than getting through the reserve, and at first I thought I’d need to retrace my steps, but happily it is possible to get out, quite close to the East Usk Lighthouse, smaller sibling to the West Usk Lighthouse I’d visited the day before and could see, a small white speck, far away across the Usk river mouth. 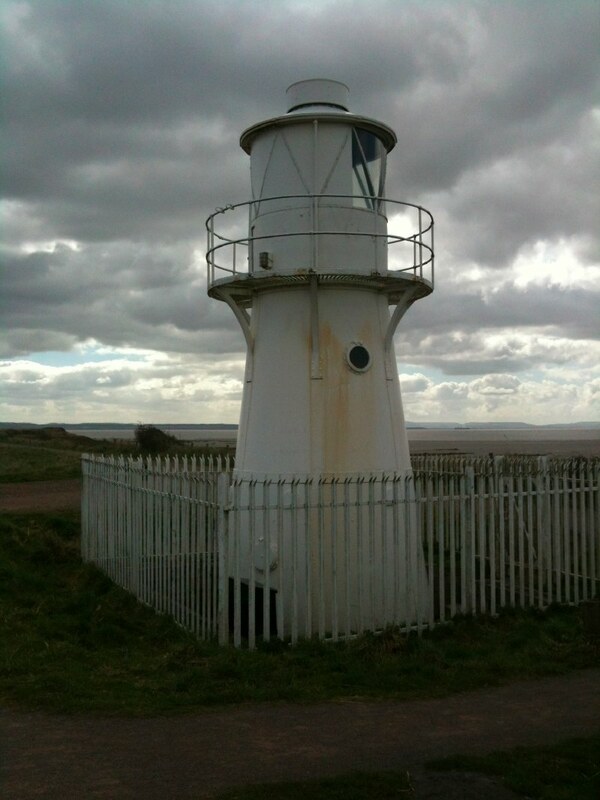 Although the East Usk Lighthouse is now diminutive, it evidently once stood tall, but was partially buried by fly ash tipped in the area. Interesting that this ex-industrial site is now a ‘natural’ environment. It was at the lighthouse that I experienced my first Twitter failure. My original intention was to tweet extensively as I walked. The previous day, because I’d been walking with Andrew, I’d not done this, but decided to do better this second day. However, despite there being signal when I looked, it was clearly insufficient, and my carefully crafted tweet was lost, sadly, like getting lost myself, an experience that would repeat until I largely gave up on Twitter. Even three or four miles from a major South Wales city, technology was failing. Apart from a few detours inland to cross streams, or bypass land where the Coast Path officers had not been able to negotiate access, the day’s walking was all along a great dyke, with salt marsh leading to grey mud on the right and drained farmland to the left, mini-Holland. 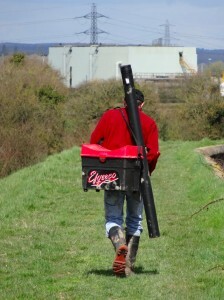 I passed Goldcliff, which has the last remaining ‘Putcher Rank‘ in Wales. 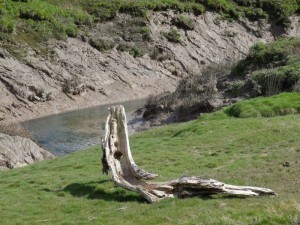 All along the Severn estuary the remains of fish traps can be found, lines of posts going out into the mud, where once wicker baskets would have been laid to catch salmon as they made their way up river. 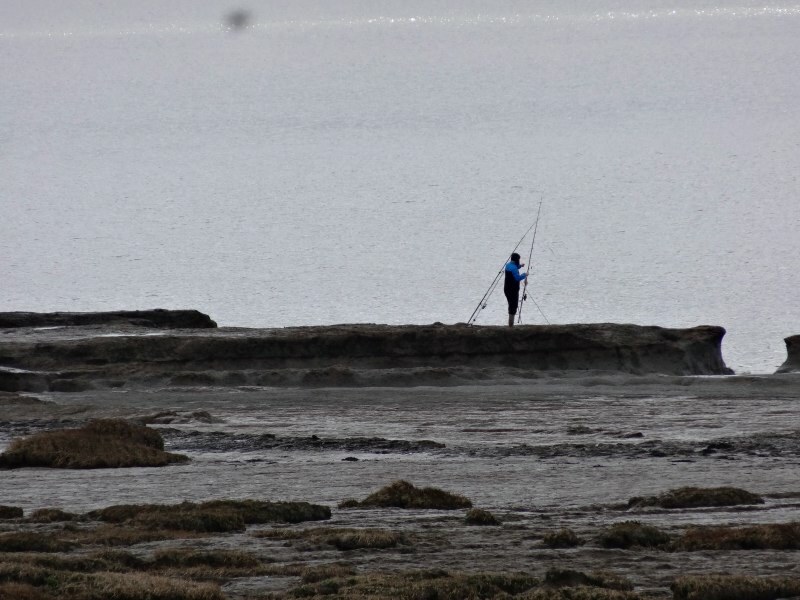 The Goldcliff Fisheries were the last, but may not be operational anymore, as their web page says they were hoping to restart fishing in 2007 after a period of set-aside, but were waiting for the Environment Agency‘s approval. I had arranged to meet Matt Chilcott and Baronne Mouton for lunch at the Rose Inn in Redwick, about 3/4 mile inland, and clearly I was running late, even before a rain squall forced me to don waterproofs, but I could not find mobile signal to let them know I’d be late. 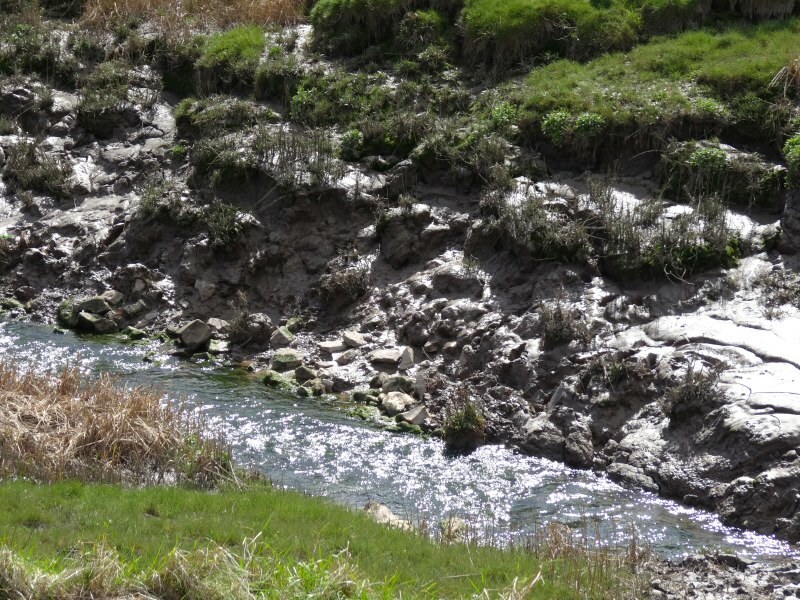 This was compounded by not being at all sure which road that met the path led to the village. One mini-mission during the walk was to look out for these ‘off path destinations’, to see how well signposted they were, and here, at my first attempt, I found signage wanting: there were plenty of finger posts to show me the way along the path, but nothing to say what lay even a short way inland. I came to what I believed was the first road towards the village, but still a mile and half to go. However, joy, I had signal. I rang, got through to them where they were enjoying a pint at the Rose and chatting whilst waiting for me. To speed things along I gave instructions as to where I was and they drove off to pick me up. Only when a map slowly loaded on my phone did I realise that I had come further than I’d thought and was actually at the nearest point. Of course, while I had mobile signal Matt, driving in the opposite direction, clearly had none, and the best I could do was leave a message and start to walk along the small lane towards Redwick. It was not far, but just as I got towards the village I found the lane ahead flooded with slurry. I’m not sure if the tank had overflowed, or the farmer was deliberately pumping it out, there was some piping around to suggest activity, but not pumping it off the road. Even with walking boots on, it would have come over the tops, but this day I was walking in just running shoes. 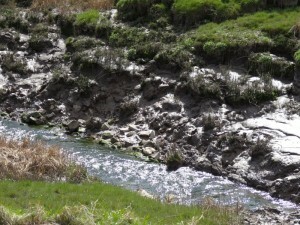 Happily I found a pile of gravel filled sandbags, I assume these were for directing the flow of slurry, but I laid them as stepping stones at the shallowest point and made my way gingerly across. So I got to the Rose Inn, not too filthy footed and again unsuccessfully attempted to ring, until a car pulled in and it was them. Matt is from University of South Wales, Newport, but seconded to CMC2 a community interest company set up by Monmouthshire County Council to promote sustainable development. Baronne is (in the words of his website!) a ‘web frontiersman’ living in Monmouth and planning to create a new web conference BBQsrc in the heart of the Wye Valley. Both have been involved in the launch of MonmouthpediA, a collaboration between WikiMedia and Monmouthshire County Council to create the first ‘Wikipedia Town‘. I will see more in a few days when I get to Monmouthshire, but essentially the town has been filled with QR codes that link to special Wikipedia pages for each monument, shop, and indeed anything you can stick a QR code to. In addition free WiFi access has been provided in areas of the town to make it easy to snap QR codes with a smartphone and see the associated web content. Unfortunately our lunch was rather brief due to my lateness, mutual lostness and Matt‘s afternoon meetings, but Matt did have time to drop me back at the path, so I didn’t have to brave the slurry lake again … however, I hate to think what his car smelt like for the rest of the day. As a schoolchild on a fine day I would sometimes walk out from Cardiff, either on my own, or with Martin, my best friend. My preparations were slight. I would fill up my water bottle, one of those metal military-style ones that could clip to a belt. If I had any money I might go to the baker’s and buy a single cob roll, the kind with a crusty top; from the fridge I would take one or two Dairylea cheese slices, and, if I was lucky, maybe a chocolate biscuit. I rarely had sufficient money for the bus, and for rainwear I had an old cut down raincoat of my Dad‘s, that was sufficiently large that I could wear it more like a poncho. I most often went north, towards the low hills that surrounded the city, and the foothills of the coal valleys beyond, as this was the fastest and most pleasant route out of the city. Occasionally I would go west towards Penarth and the coastline beyond, although that involved a good few hours’ walking across the city before I reached the countryside. Only once or twice I went east along the coastline I had walked on the first day. With a ten-mile radius for a reasonable day’s walk, that took me only part of the way to Newport, but still, my abiding memory was one of acres of flat drained farmland, an seemingly endless seawall, and the thick foul grey of estuary mud. To be honest, for a 16/17 year old’s eyes, boring. This was one of the reasons to get this bit of coastline done first, to ‘get it out of the way’, but I was also aware that I no longer had the eyes of a 16/17 year old, and that this area was rich in wildlife. So 36 years later, three times the age of those eyes, it did seem different. An austere beauty, but beauty nonetheless, and although it was always the same, yet it was not; my eyes after hour upon hour of gazing at flat drained land, dyke, salt marsh, grey mud and sea, became aware of variations, changes in the quality of the sea-washed grass, the flotsam, and occasional lines of abandoned fish-trap poles. I have no vocabulary for these subtle differences, and I struggle, without the scaffolding of language, to recall these now, and yet, in the midst of the time, I developed the tacit understanding of the inhabitant. I live my life in mortal fear of boredom, I hate to be early for meetings in case I am stuck sitting, standing, waiting; if I am setting off somewhere and realise I do not have a book, or paper, I begin to feel out of breath, my heart rate rises – a true phobia. In all those miles of monotonous walking, I never felt bored for a moment. Maybe I was lost in my own thoughts, maybe lost in the landscape, maybe simply lulled into a semi-trance by the constant rhythm of the walk. So it was, with surprise, when a man walked along the path towards me and greeted me by name. It was Jez, a lecturer in the Arts Faculty at UWE. He had left a note on my web site to say he would try to meet up, but I had entirely forgotten. A few hundred yards on from where we met a road came down to the sea and at the end of it was Jez‘ VW camper van, like the one Fiona and I used to have many years ago when the girls were little. He had driven down the road from his home, which was not far away, and waited, I don’t know how long, for me to come along. Jez made me a cup of tea … well actually I think we got through several, he fed me biscuits … and was there cake too, I can’t recall? He told me about his ongoing chef d’oeuvre Coastline. On weekends and holidays Jez walks the coast of Wales pushing his bike with a small video camera mounted on the handlebars, and then cycles back to where he has left the van. Each section becomes a audio-visual work, with time-lapse video overlaid with soundscapes, or interviews … and he recorded our conversation, so maybe on one of his videos there will be my voice. After a while Jo and Jeannie, his wife and daughter, came cycling down the road to say hello, and then after they left we talked more. I felt so blessed at this rich and unexpected meeting and privileged that Jez had taken so much effort to make it happen. However, I still had many miles to walk, and so, reluctantly, set off again. I can’t recall when it first came into view, but for much of the day the Second Severn Crossing dominated the view, first quite small in the distance, but gradually closer and its size more impressive, its white concrete piers striding for five miles across the Bristol Channel, to Bristol docks, the seaside towns of North Somerset and the brooding presence of Hinkley Point. As the bridge drew closer, the path temporarily diverted inland, to the north side of the M4 and then back again less than a mile from the bridge when it came out onto a concreted waterside path leading towards and then under the bridge. The noise of traffic overhead is in its way ineffable, the ongoing low-pitched rumble broken by the periodic rattle as a lorry or car crosses directly above (hear it here). This all set looking through a tunnel of concrete piers, rising from the water as far as the eye can see. However impressive the Second Severn Crossing is, once I passed under there was no looking back, for, far ahead, lay the old Severn Bridge. By ‘old’ I do not mean medieval stonework, not even Brunel‘s Victorian ironwork, but the 1966 motorway bridge. 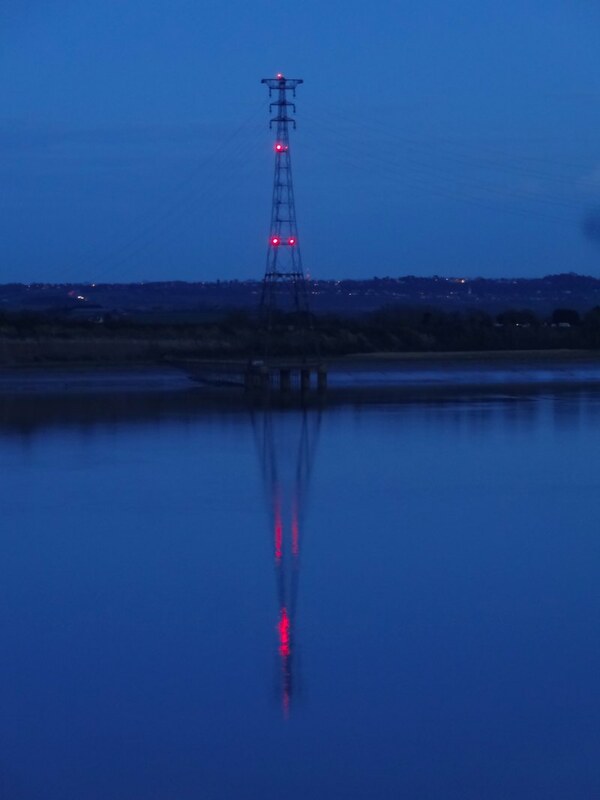 My target for the night was to cross the bridge and sleep at the Travelodge at the motorway services that used to be called ‘Aust‘, but now Severn View. This is a detour from the Wales Coast Path, which passes the west end of the Severn Bridge, but stays firmly in Welsh territory. My English diversion would be for nostalgia’s sake. 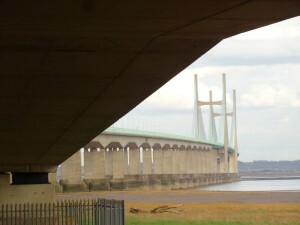 As a child I recall the first time we crossed the then’ ‘new’ Severn Bridge. Until that time the only way to cross was either to wait for the ferry at Aust, or to drive thirty miles north along the bank of the Severn to the first bridge at Gloucester. We were driving in a blue Ford Popular, Mum, Dad, Jacqui and I. When Jacqui and I were very little we had another Ford, one of the black taxi-cab style ones, but this was the modern saloon with rounded curves. Dad loved the inventions of the modern world, and so it was not just Jacqui and I who were excited as we approached this wonder of the 1960s white heat of technology. In years to come I would often find my imagination had made things bigger than they were, so was disappointed to see them in reality. But at this age and this time there was no disappointment. We gawped in amazement at the immense size of the bridge, until Dad said, "this isn’t it yet", we were still on the maypole-suspended Wye crossing that leads on to the twin-towered cable suspension of the Severn Bridge itself. In memory of that day when we stopped at the services and walked along to the observation point where we could look down from the red sandstone cliffs across the expanse of the Severn and the glory of the bridge, I would cross over and stay the night on the far side. But there were still many miles to go, and it was two and half hours later before I got there. Soon after the Second Severn Crossing was a vast, strangely shaped, brick building at Sudbrook that I realised was the air pumping station for the Victorian railway tunnel that dives through the rock deep below the water. I went slightly wrong at Sudbrook, when the Coast Park sign seemed to direct me through a tiny rough gap between undergrowth onto a small semi-wild playing field. I thought I’d got it wrong and backtracked onto the main path that skirted the area on the landward side. It was only when I got to the other side that I saw the far more clear sign from the opposite direction. 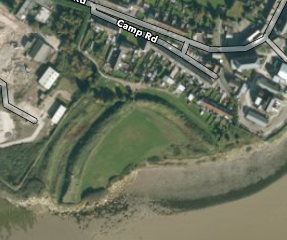 Now, with the benefit of satellite maps, I can see a half round embankment and the name of the road leading to it, ‘Camp Road‘, clearly an Iron Age fortification, most likely once a full circle, but cut in half by riverside erosion. Not much further again is a small estuary. On the map it is marked simply ‘Red Cliff‘, which is hardly a defining feature in this area. 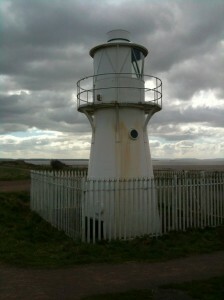 Small boats lie on the mud and a tiny lighthouse rises on the diminutive headland beyond. The Severn Bridge (the proper one!) is now close, barely two miles away across the water, and in the middle of the flow, a rock with another small light, Chapel Rock on the map, with the remains of St Twrog’s Chapel on it, just a small piece of broken wall. 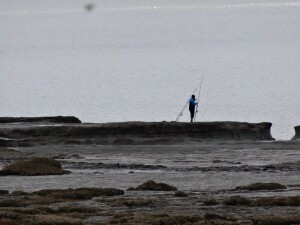 It is marked as entirely below the high tide mark and accessible only at low tide, but a small grassed area clearly does always peek above the high water, suitably isolated for the medieval hermit. It was evidently well visited in the 14th century and a light maintained there, but happily abandoned by the time of the 1606 flood. 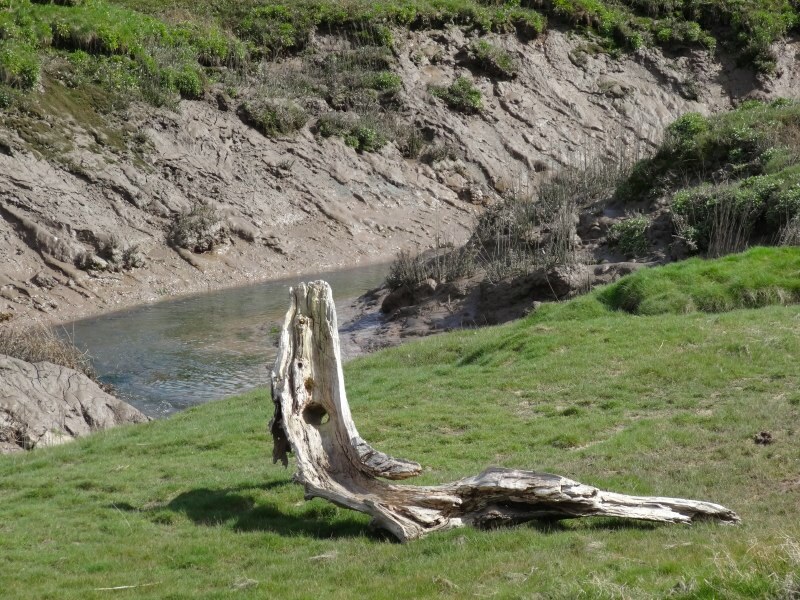 The path does not stop the tiny stream, St Pierre’s Pill, but instead cuts inland to the village of Merthyr Tewdrig, where a wooden statue of Brenin Tewdrig, king and saint of Gwent, who in a tale of Arthurian tenor, abdicated in favour of his son to live a life of prayer, but then took up the sword to defend the monastery from the despoliation of the heathen Saxons. The Saxons were defeated, but mortally wounded Tewdrig was on his way to the isle of Flatholme to be healed when he succumbed to his wounds and was buried here. It was approaching eight o’clock and I had been walking for more than twenty miles when I passed through the large industrial estate on the west bank of the Severn. I passed a warehouse where they were still at work, wind-turbine towers laid out in ranks, and then, eventually, onto the bridge itself. Although it is a motorway bridge there is pathway each side for bicycles and walkers; strictly the southern side is for walking and the northern side for bicycles, but in practice there seems no difference and I wasn’t sure how to get onto the northern side anyway. I looked back along the M48 leading into Wales, a deep sunset forming in the west, and then out along the bridge arching to England, nearly two miles away; first the single maypole support of the Wye Bridge that I remember so well, and then the dual towers of the box-girder suspension bridge. It was late so the traffic was not so heavy, and it was not so much the sound, but the feel of the vibration of trucks passing and the shaking and rattling of the structure that made me glad to know it had stood for 47 years and was unlikely to collapse just now, whatever my senses told me. I was crossing the bridge for nostalgia’s sake, thinking that it would be a long slog, exposed to the elements. Worthwhile, I hoped, for its symbolic value, but not of value in itself. Nothing prepared me for the deep serenity of that crossing, with the lights and sound of the traffic still there was a sense of peace beyond anything I felt at any other point of the long journey that was to come. I started to cross with the sunset and the day moved from dusk to evening as I walked, for nearly half an hour from side to side. First past the barracks on the low headland between the Wye and the Severn, and then out along the wide span. 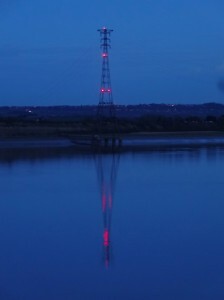 The lights shone on the wide span of the Second Severn Crossing, now many miles downstream towards the sea, and red lights topped the towers close at hand that suspended the electric wires connecting the Welsh and English grid. Half way between Celtic and Anglo-Saxon worlds, above flowing water, yet suspended in air, it is no wonder that there is a magic. The waters far below seemed still in the half light, and sounds of birds were muted by reflection. I remembered a time as a schoolchild, standing on the bridge at the top of the hill in Penylan in Cardiff, looking out over the dual carriageway of Eastern Avenue, hearing the traffic below, and then realising that behind the sound of engine and tyre on road there was a deeper silence. Here, the deep peace needed no seeking or meditation. And so to rest, at the far side, a Travelodge, the modern equivalent of the monastic hospital, but the refectory was closed, I was too late, as if vespers had already been called, but more likely open during commuting hours only. So my meal was the pies of the garage, open all hours, a traveller’s fare.